Yesterday evening, legislators released a $20.6 billion budget compromise that will likely to be voted upon and sent to the Governor’s desk for final approval later this week. 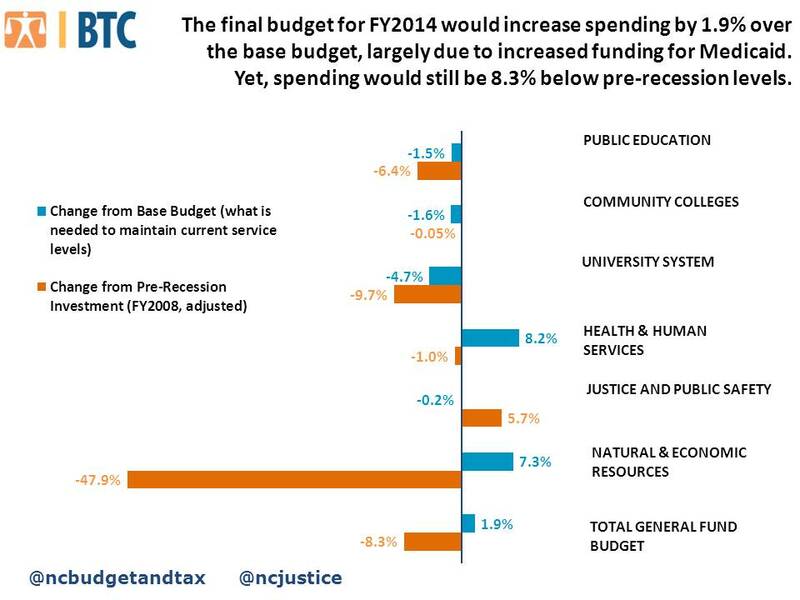 This budget shorts investments in vital public services, and fails to catch up and keep up with the needs of a growing North Carolina population across major service areas (see the chart below). Some of the budget cuts could have been avoided had lawmakers decided not to drain available revenues by $524 million over the next two years through an ill-advised series of tax cuts that primarily benefit the wealthy and profitable corporations. Increases teacher-to-student ratios used for determine total funding allocated for classroom teachers. Higher ratios reduces total funding for classroom teachers, meaning local schools will have to cut teacher positions or fund the positions with other funding sources. The Department of Public Instruction estimates this ratio change will result in 5,200 fewer teachers. Cuts funding for teachers assistants by 21 percent for FY2014 and by 19 percent for FY2015. Local school systems will now have to pay for teacher assistants positions with other funding sources or else reduce the number of TAs in classrooms. Provides $10 million in FY2015 for private school vouchers, known as Opportunity Scholarships. Students who meet a defined income threshold and other selected eligibility criteria will be provided up to $4,200 per year in taxpayer funding to pay for private tuition and expenses. Reduces funding provided for bus replacement and requires buses to be in use for 20 years or incurred 250,000 before qualifying for replacement funding. These changes result in $29.8 million in funding cuts for bus replacement for FY2014 and $39.1 million for FY2015. Provides $7 million for school resource officers in elementary and middle school and $18.6 million to implement the Excellent Public Schools Act, which include various initiatives aimed to have all students reading at grade level by the end of the third grade. Strips the salary boost for teachers with advanced degrees beginning in FY2015. Raises tuition at community colleges by $2.50 per credit hour, and raises continuing education fees by $5. Also, raises tuition for out-of-state residents in the UNC System by 12.3 percent. Eliminates the senior citizens tuition waiver at community colleges. Provides $4.8 million in one-time dollars for NC Back-to-Work program, which is a retraining program for the long-term unemployed in the community college system. Restores the management flexibility reduction to community colleges but cuts an equivalent amount in curriculum formula funding and continuing education funding. And, Mandates a $139.4 million management flexibility reduction to the UNC System over the biennium. Phases-out the tuition grant for NC Science and Math graduates, and keeps steady recurring state support for need-based aid to public college students in the UNC System. But, the budget increases need-based aid to private college students. Cuts $3.2 million in funding for the National Board Certification Loan Program that provides loans to teachers pursuing certification. Provides $434 million in FY2014 to fully fund the projected enrollment growth in the number of people eligible for the Medicaid Program, and provides $49.7 million to pay for enrollees expected to join Medicaid as a result of the Affordable Care Act. It limits the number of doctor visits covered for participants from 22 to 10 visits, raise co-pays, and lower reimbursement rates for providers. It keeps pregnant women on Medicaid, diverging from the Senate proposal. Allocates lottery funding to temporarily keep 2,500 slots in the NC Pre-K program. These “additional” slots would come just as 5,000 slots expire this month, meaning the number of slots will be reduced by 2,500 slots. Does not alter eligibility requirements, as proposed by the House. Provides $4.6 million in temporary funding for group home residents who are ineligible for help through Medicaid. Advocates requested $10 million in funding to meet the full need. Keeps the Child Fatality Task Force, which is a long-running legislative study commission whose aim is to reduce child fatalities. This program was eliminated in the House proposal. Directs the Department of Health and Human Services to create a Medicaid Reform Advisory Group to review and create a plan (but not implement) for significant reforms to the Medicaid program. Also, allocates $100,000 to study the effectiveness of the Community Care of North Carolina model. Creates 10 positions to conduct health and safety inspections of hospitals and abortion clinics. Reduces funding by nearly $5 million per year for Adult and Drug Abuse Treatment Centers. Cuts AIDS Drug Assistance Program by $8 million each year, with the expectation of some additional federal funds. Provides $1.5 million to support adoptions through private non-profits, $1 million to support outcomes for children living in foster care, and roughly $960,000 to support maternity clinics and maternity homes. Provides a $45 million expansion, following two years of steep reductions. However, the bulk of this comes from shifting DENR administered off-budget trust funds to on-budget Authorities and programs, including the Clean Water Management Trust Fund–a fund that is designed to improve water infrastructure. Creates the Water Infrastructure Authority (WIA), a new Division which receives a $4 million recurring appropriation to finance staff, development of a new water and sewer database, and grants to local communities. The new division will also administer the State Drinking Water Revolving Fund, the Clean Water Revolving Fund, and the CDBG Infrastructure Grant Program. Provides a $17.8 million increase to the Department of Commerce, the state agency in charge of managing the state’s economic development initiatives, including job training, industrial recruitment, incentive funds, and community development block grants. Creates a new Division of Rural Economic Development to promote job creation, infrastructure development, and small business development in the states most distressed rural counties, following the dismantling of the NC Rural Economic Development Center in the Commerce State Aid budget. The Center was formerly funded at $16 million, and the new division is funded at $11.3 million. Cuts the Commerce-State Aid budget by $38 million, a reduction of almost 64 percent to the area of the budget that provides critical assistance for community and economic development in the poorest regions of our state. Recurring funding is completely eliminated for the following nonprofits dedicated to helping distressed and economically lagging communities: Community Development Initiative, Institute of Minority Economic Development, Land Loss Prevention Project, NC Association of Community Development Corporations (CDCs), NC Indian Economic Development Initiative. Provides $2.5 million to fill 69 vacant trooper positions that are currently unfilled because no funding is available. Closes four correctional facilities and four youth and detention institutions, and converts one correctional facility to a minimum custody prison for a total savings of $28.8 million. The closings and conversion will eliminate 825 positions and is in response to a declining prison population resulting particularly from the Justice Reinvestment Act, which aims to manage growth in the state’s prison population by creating better outcomes for offenders through targeted programming and treatment to reduce recidivism. Provides $6.2 million to fund 175 new probation officer positions and for reallocating surveillance officers to probation offers positions in order to meet expected increase in number of probation and parolee population. Provides $2 million to the Broaden Access to Community Treatment program, which provides substance abuse treatment to offenders that are deemed as high-risk for recidivism and in need of substance abuse services. Provides no funding for Drug Treatment Courts, which the governor proposed in his budget. Cuts funding to the Administrative Office of the Courts by $4 million in each fiscal year. Allocates 5 additional vacation days to state employees but no pay raise. Creates a $10 million fund to compensate verified victims of the State’s Eugenics. Eliminate the Displaced Homemaker Program, which provides important workforce development services to residents with barriers to self-sufficiency—such as a recently divorced or widowed low-income working parent. Funding would be redirected to the Domestic Violence Center Fund. Cut nearly $877,000 in funding for the Housing Trust Fund, which funds affordable housing projects and helps ensure that families are able to pay for housing expenses and still pay for basic necessities. The North Carolina Budget and Tax Center will continue to closely examine the final budget compromise. And tomorrow, we will break down the general fund availability statement to give you an idea of how legislative leadership pays for their budget. In case you didn’t notice…we are still kind of in a recession. 8.8% unemployment somewhat hinders new tax receipts…..and very closely correlates to the decrease in spending. Funny how that happens. Until we get the long term positive effects of cleaning up the mess the democrat party made over ~140 years we are going to be in an environment where we cannot get up to pre-crash levels. As an aside…I would think you guys should be lauding the fact that the NCGA has dedicated so much to one of your pet pork programs in Medicaid. You would have thought the sky was falling a few months ago, but we are now giving that program the lion’s share of growth. Don’t say you did not get anything out of the budget process. You realize 1890 republicans were essential democrats and the Dixiecrat dems of 1890 resemble the modern day republicans? So casting that wide of a net is remarkably inaccurate but nobody about being accurate anymore so long as you can push your ideology by conjuring distrust. I have to wonder if the Water Infrastructure Authority is there is “disprove” any of the claims of the connections between fracking and drinking water. abortion. I think you’ll find there are more workers–~ 100-150/year–and NC DOL can’t even count them correctly and always under-reports. So why the huge cut on the education side of the house? It would seem illogical to take a state that is ranked 46 our of 50 and further dissolve any significant chance for improvement. Huge reduction in loans for National Board Certification, and no longer rewarding teachers for advanced degrees seems like a disaster for incoming/retention of educators. I would not call it huge, but cuts to education are a precedent set by Bev Perdue. Also, like all entities in this day and time education needs to do more with less. Now don’t mention the fact that they continue to keep/expand the fat cat administrators who just spend their time thinking up socialist plans to indoctrinate children rather than focus on the actual teachers who could make the difference in education. I used to live in Guilford county where a new superintendents’ first move was to hire about 5 regional superintendents at mid six figure salaries. Was this really needed? Why would they have consolidated the local school districts over the years, just to go back to the same concept? Each new district had most of the same administrators as the central office….that was efficient? No, just power and bloated government schools. Unless you are a teacher, please don’t presume to know what doing more with less really is. If this budget passes, I will be moving out of state…and I’m sure I won’t be the only one. Wait a minute everyone – we’re missing the point in this discussion. No one can dispute the shrinking of teacher pay, increase of class size, money pulled from public education to support private education. Don’t forget the gutting of the earned income tax credit, the neglect to extend unemployment benefits and the refusal to expand Medicaid. Is this the North Carolina we all want to live in? We moved to this beautiful state in 1973 and I have always felt hopeful in the fact that we were working to improve education, healthcare, the environment and jobs. Not so now! We will all pay the price over the coming years. The worst thing about this situation is that it didn’t have to happen – there are positive solutions to deal with the challenges and keep us on track for a better quality of life. That’s the saddest part of all this. Proposals for positive solutions have been ignored and it isn’t over yet. Hold onto your hats!